In our last article on Responsive Design we examined Adobe’s new Edge Reflow program, which is designed to help facilitate the process of responsive website design. Unfortunately, we found that, like Dreamweaver, Edge Reflow is designed almost exclusively for website production, with no tools for creating responsive email files. * There is, of course, an alternative, and that is to code it yourself. Before you tune out completely, keep in mind that as long as you don’t try to get too fancy, creating media queries is not that daunting. 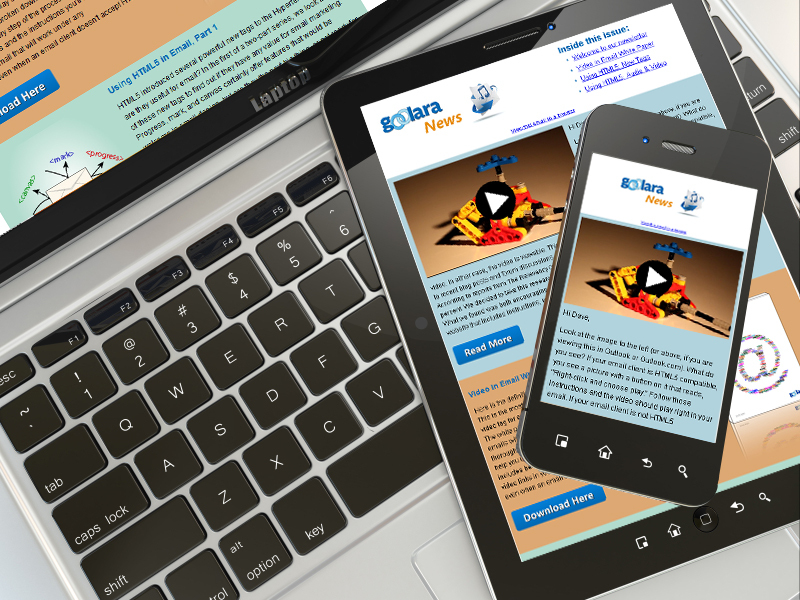 This article is designed to help you get past the main stumbling blocks inherent in using responsive design in emails. As always, the K.I.S.S. rule applies. Keep things simple and you shouldn’t have any trouble building an effective responsive design. Once you’ve created your basic template, building new templates becomes a lot easier. Inline styles are always more compatible than styles in the head tag. The second thing to remember is that every email client plays by its own rules. Some ignore any expressions that appear in the head tags, which means your responsive design won’t work with that email client. As we discussed in the first article in this series, Gmail will use the head tag information if you view the mail on your iPhone with Apple’s Mail app, but not if you view it with Google’s Gmail app. Even with two email clients that both accept head tag styles, there may be display differences, so thorough testing is necessary every step of the way. Before you begin coding your responsive design media queries, you need to make sure you are starting on the right foot, and that means using tables. If you hang around web designers, or, at least, hang around the forums that web designers hang around, you’ve probably heard the mantra that you should be using divs not tables. “[Y]ou MUST use tables for tabular data!” A web designer on Stack Overflow posted. “Tables exist for that purpose, you MUST avoid tables only for layout purposes by using divs instead.” True enough if you’re designing a web site, but as every email designer knows, divs don’t always work in email. Outlook.com, for instance, ignores floats and margins, two of the primary components necessary for positioning elements on a page. This is especially ironic considering that Outlook.com is just about the only email client that actually uses most of the new HTML5 tags. As with any other element on a page, tables can be assigned different attributes in the media queries. The main difference with responsive design is that elements with different media query attributes will need to be in separate tables to behave predictably. But before we get to that, let’s look at the basics of a media query. You may want to use a smaller or a larger number, that is up to you. Smaller smart phones and the early iPhones had screen resolutions of 320×480 pixels. This number has increased substantially over the past few years. Newer iPhones have screen resolutions of 640×1,136 pixels, and the Sony Xperia Z Ultra and Samsung Galaxy S4 come in at a whopping 1,080×1,920 pixels, which rivals some desktop monitors. These numbers may suggest that, at 640 pixels, the iPhone should display the full sized version of the email, but it will not. The number of pixels listed in the media query and the screen resolution are not equivalent. Newer iPhones, for instance, have a resolution of 640 across, but a device width of 320. This is because the width information in CSS does not take into account the iPhone’s retina display which doubles the number of pixels available. Likewise, the Samsung Galaxy Note II’s 720 pixel resolution comes in at 480 pixels in screen width. Of course, you can take pixel densities into account when you define your media queries, but this will only add an unnecessary layer of work to your email design. You may also want to create an intermediate set of rules for tablets and the very large phones (“phablets”), but keep in mind that this will add another media query and another set of instructions to your head tags. Also keep in mind that, if properly designed, your email should be readable on these devices without requiring any responsive adjustments. An email with a max-width of 650 pixels wide with 12 point type should be perfectly readable on any tablet (some people prefer to use the more cautious 600px). 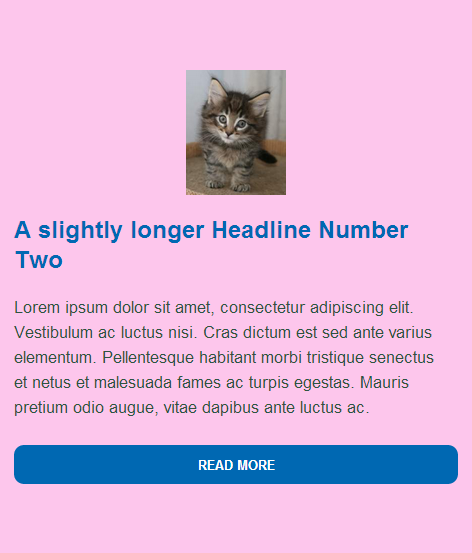 With media queries, you can move elements around or hide them to your heart’s content. If you are using Dreamweaver or a similar program to create your email, you may want to do everything using a CSS file to ensure consistency throughout the email, and to make it easier to change individual elements at a later date. Just remember that you’ll eventually need to convert all that information to inline styles. You could take the CSS file and stick its contents between style tags in the head, but not all email clients use head tag information. For the most compatible results, after you’ve added the CSS information to the style tag, you should next run the whole thing through an inline styler. This will inline everything, but it may also throw out the media queries at the same time. If so, you’ll need to replace these. The expressions at the top that appear before the media query are there to eliminate email formatting issues. The first two expressions are for Hotmail, and the others are there to reset HTML5 elements to display elements as block elements, which helps control formatting things such as tables and lists. The three style classes shown after the media query affect different parts of the design. 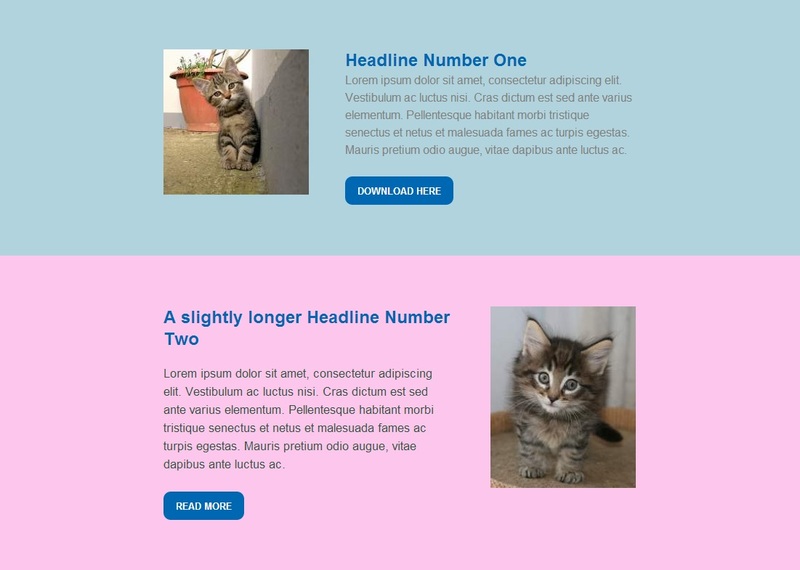 The first one (td[class=”SecondKitten”]) causes the table cell (td) to disappear when the email is viewed on any device that is less than 525 pixels across. The second one (img[class=”FirstKitten”]) forces the image (img) to shrink to the width of 100 pixels, regardless of its original width. Likewise, the third class (img[class=”FirstKitten”]) forced the image to expand to 300 pixels. The “FirstKitten” class indicates that if the screen’s width is 525 pixels or less, the image’s dimensions shift from 200×200 to 300×300. Normally, you’d want to reduce your image for a smaller screen, but this example demonstrates that you are not limited to only reductions. Just keep in mind that enlarging above an image’s resolution may result in some pixelation of the image. Images used in this demo are courtesy of placekitten.com. You can see that a few interesting things have happened. The kitten at the top of the page became larger, deteriorating the image slightly, while the kitten at the bottom of the page disappeared entirely. The call-to-action buttons lose their original size attributes and switch to the attributes in the media query, which specify 100%. This causes the buttons to stretch across the width of the display, which works well for small screens, but would look bad on a monitor. A quick survey we did recently indicated that most of the email designers who are actually creating responsive layouts are not using visual editors such as Dreamweaver, but coding by hand using HTML-oriented text editors such as TextWrangler, Sublime Text, or Ultra Edit. Although Dreamweaver does have tools for creating responsive templates, as mentioned in our other posts on the subject, it is aimed primarily at web designers and often adds unwanted code to your files. If this all sounds a bit daunting, it shouldn’t. Remember our initial advice: keep it simple. Besides, remember that others have gone before you and there is no reason to reinvent the wheel. Another source for bare bones responsive email design ideas is Code Pen, an online sandbox for testing HTML. While most of the examples given on this site are for web design, a search for “responsive email” will yield several useful examples of emails that were created to be responsive. There are also some very good online tutorials available on YouTube. These range in quality from professionally-made, “I-can’t-believe-they’re-not-charging-for-this” instructions, to people with indecipherable accents talking into their laptops at the local Starbucks. Lynda.com also features a thorough tutorial on responsive email design by Chris Converse (includes sample files). However you choose to create your responsive email, you’ll need to test it across as many different platforms and devices as possible. Sometimes things may look perfectly acceptable across nine clients and devices and then the tenth one will send you back to the drawing board. As with all code, a misplaced percentage sign or missing bracket can ruin everything. Due to the nature of responsive design, it can be difficult to tell if your media query is working until you see it in action. In the next installment of our series on Responsive Design in Email, I’ll discuss the process I went through to come up with a good responsive design, and what I learned along the way. * The latest release of DreamweaverCC, now includes the option “Define in page” for media queries. By using this command, you can add the media queries to the top of the HTML document and still inline all the style information. With this change to Dreamweaver, it might be possible now to use it to create responsive email designs within the program. It’s nice to see Adobe finally paying attention to the needs of email designers. ** If you would like a copy of the original HTML file, you can download it as a zip file here, or as a text file here. *** This advice does not include Styled Alt Tags, which may not work in certain clients, but these are less an aspect of design than a fallback when images are not displayed. This entry was posted in Design, Email marketing, Trends and tagged CSS, head tags, HTML, media queries, responsive design, screen size on October 15, 2013 by Jim Morton.